On September 17, 1943 this specific Arado 196 went on a mission to protect a convoy consisting of three ships (UJ 2104, Paula and Pluto) on their way from Piraeus to Rodos. Near Naxos, British Beaufighters attacked the convoy and the Arado was damaged and had to perform a controlled ditching at sea. The crew was saved by UJ 2104, but the aircraft sunk shortly afterwards. (See the picture below, shot minutes before the Arado’s sinking). The crew was reported as “rescued”. The convoy continued on its way to Rodos, but north of Astypalaia, they were attacked again, this time by allied destroyers. The two cargo ships sunk, and UJ 2104 was badly damaged. 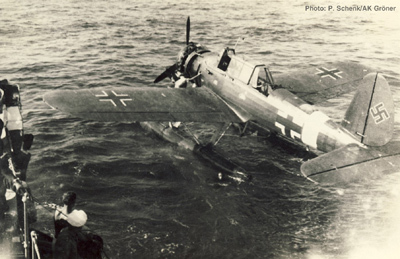 This picture of the Arado D1+EH was taken by an officer of UJ 2104 just minutes before sinking. The picture was hidden for 5 years in a foam soap box during time as POW in Egypt. Approximately 60 survivors, including the crew of the Arado, managed to reach Astypalaia, which was under Italian control. The survivors of the convoy were transferred to the British shortly after and remained POW until 1948. 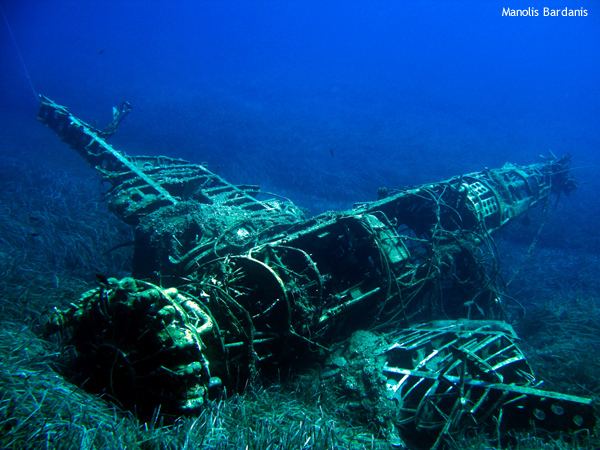 The wreck was found by Greek fishermen in 1982 at a depth of 91m and was moved in a bay of the island Herakleia. 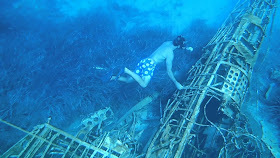 Acclaimed researcher Manolis Bardanis (www.naxosdiving.com) is credited with a detailed research on this wreck’s history, in cooperation with other historians. 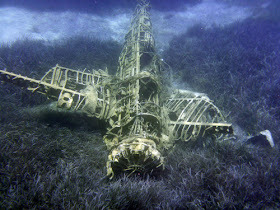 WW2 aircraft crash sites – Nearly 200 identified!